Powers: He can manipulate and control Electricity, erect force fields and has limited flight capabilities. Notes: Black lightning was created after Tony Isabella convinced DC comics not to create the Black Bomber; A white man who could transform into a super powered Black man complete with Afro after shouting “Black Power”; a very controversial concept even today. 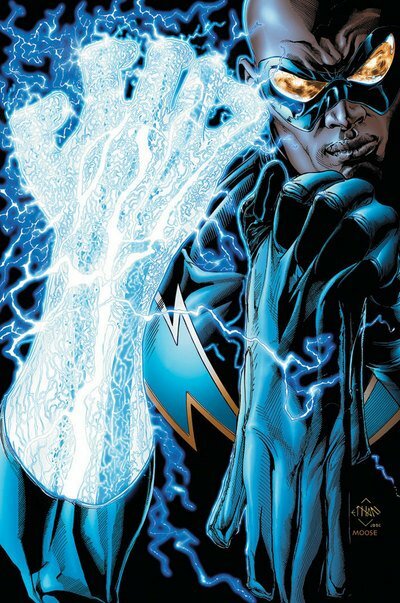 Jefferson Pierce the man who would one day become the world-renowned superhero Black Lightning was born in “Suicide Slum”, so named because the environment was so harsh and degraded that suicide was the only way to escape it. Ironically it was only two miles away from the Daily Planet the famous publishing house though even Superman noted it may as well have been another planet due to how different the two places were [Adventures of Superman vol.1 #428]. As a child his father was killed accidentally in a mob hit leaving him fatherless and his mother a widow. Times were tough for the young Jefferson especially as his mother worked long hours to take care of them and his lack of a positive male figure in his life. When Peter Gambi opened a shop below the Pierce apartment Jefferson at last had found a father figure. With Gambi’s encouragement Jefferson excelled both academically and athletically. At age 18 Jefferson made it to the Olympics and in the process gained fame only bolstered by his positive message that hard work was the key to success no matter where one lived. At the Olympics he gained two gold medals and notoriety. Receiving a scholarship and endorsement deal he went to college where he received a teaching degree with a focus on English. At the next Olympics he won a gold medal in the decathlon. All this spring boarded him a teaching job in New Carthage. While away from his hometown he had married Lynn Stewart and they had a daughter Anissa Pierce. He later returned to Metropolis for his mother’s funeral. While in the Suicide slum once more he took up a teaching post and cam into conflict with the criminals call “The 100”. He took to patrolling the streets at night at night as the hooded “Black Lightning”. While sleeping Jefferson continued to manifest his latent metahuman abilities [Black Lightning: Year 1 #1]. As the vigilante Black Lightning he became a thorn in the sides of the 100 and they set a trap for him which resulted in him being shot in his arm and leg [Black Lightning: Year 1 #2]. Encouraged by his Daughter, wife and Gambi who made him a Kevlar and Noprene costume with a grounding belt to aid in him in controlling his metahuman powers the true Black Lightning was born! [Black Lightning: Year 1 #2]. With fully manifested powers he defeated the gang and made his public debut in the Daily Plant [Black Lightning: Year 1 #2]. As the conflict heated up he found himself interviewed by Clarke Kent and drawn into another trap. His skills brought him to the attention of the League of Assassins with Nyssa Al Ghul offering him the aid of the League of Assassins which he declined. Facing down the mysterious gang leader called the 100 he learned the startling truth that his father had been set up by Gambi. Even with the aid of Superman the villain still managed to escape [Black Lightning: Year 1 #3]. After confronting Gambi he tried to locate the 100, by the time he got back home he was only able to witness Gambi die defending his family from a hit. With his last breath both men forgave each other and he send his family into protective custody. Talia Al Ghul then reveals the origins of the 100 and why she will aid him in battling them. At Gambi’s funeral his marriage dissolves as his wife decides to leave the city with her mother in law and child since he refuses to put them first [Black Lightning: Year 1 #4]. Over the next few months apart Anyssa develops metahuman powers and Lynn realizes she’s pregnant again. The 100 then attack the reopened school and Black Lightning successfully fends him off with aid from Superman [Black Lightning: Year 1 #5]. When the 100 threatens to kill his students via mind control he has a final showdown with the villain and in the process the 100 has a portion of it’s power transferred to Tobias Whale who is transformed into an albino overweight monster. Turing the creature over to the feds lightning finally frees his city from their tyranny [Black Lightning: Year 1 #6]. Jefferson briefly entered a self-imposed “retirement” after the birth of his second child Jenifer. Despite this Jefferson and Lynn tried to stop Anissa from becoming a hero and instead pressured her to finish her academics before even considering that life. Jefferson was so over protective of his daughters he never mentioned them to anyone. When he and Lynn divorced she got custody of both the girls. Invited into the Outsider by Batman himself he teamed with Geo Force, Katana and Terra. They battled Baron Bedlam, Tannarak, The Masters of Disaster, Kobra, The people’s heroes, Eclipso and even the Titans [Black Lightning V2 #5]. The end of the team left him feeling adrift and he had to watch helplessly along with the rest of the world as Superman died battling Doomsday [Black Lightning v2 #5]. He later clashed with the supervillain Painkiller as he tried to shut down a drug ring. Trying to protect his city and his students he also found time for a brief romance with the younger Gail. In his battle with Painkiller he was severely injured with his fellow metahuman [Black Lightning v2 1-4]. Hospitalized and was visited by his ex-wife Lynn. He works through his pain and regret with her while coming to terms with his co-worker Walter Kasko dyeing while protecting his student from a hail of gunshots [Black Lightning v2 5]. Tobias Wale was behind the new string of crimes and he set Black Lightning against fellow vigilante Gangbuster. Wale revealed himself in time to take out both [Black Lightning v2 #7]. When a Metahuman serial killer emerged he was framed and fought the female supervillain Pierce. After defeating her and the serial killer he reconciled with Batman and found peace [Black Lightning v2 13]. When Lex Luthor was made president of the United States he appointed Jefferson secretary of Education. Later he resigned when his identity as Black Lightning became public knowledge and he seemingly killed a man. He was later pardoned for this crime and returned as secretary of Education. He continued adventuring and objecting to his daughter Anissa’s involvement with the outsiders and aiding Green Arrow. Jefferson later used his pull in Washington to stop criminal Holocaust from building a casino. He was then asked to step down and he did. Holocaust tracked him down and the two fought for what the villain saw as an affront. During infinite crisis he aided Mister Terrific in stopping brother eye and end the Omac threat. As a result of his time spent working with Lex Luthor he has made contact with many super-villains who think he’s one of them. This has allowed him to join the Justice League and be a great source of information. He recently even saved the President of the united states. Aiding the Tattooed man and his family during final crisis cost him his freedom but once thing returned to normal he rejoined the Outsiders. Upon rejoining the team he learns that Dr. Hurt has rendered his daughter Anissa Comatose and he leaves the Justice league since the new team must operate off the grid and lose contact with society. One of the weirdest things about the character was that at the start of his career he would wear an Afro-wig with attached mask! DC has rearely had an respectable record in creating minority superheroes but this was one of the better creations.